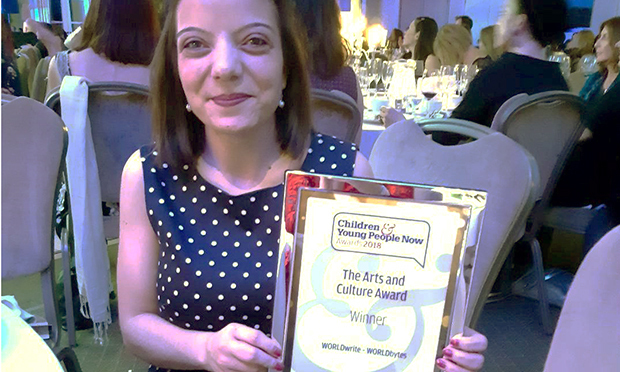 Clapton-based education charity WORLDwrite was named the winner of the Children & Young People Now Awards 2018 Arts & Culture Award category for its Citizen TV project WORLDbytes. WORLDbytes is an online TV channel featuring reports and programmes created by young volunteers. The channel’s motto is “don’t shout at the telly, change the message on it”. Commenting on the award, which she received on on 21 November, WORLDwrite’s director Ceri Dingle said: “We are amazed and thrilled to have been recognised by Children and Young People Now. Since it was set up 10 years ago, WORLDbytes has trained over 3,000 young adults to produce over 1000 educative programmes, watched by over two million people. Participants learn ‘on the job’ as professional crews to film, engage with the public, report on issues of local and global concern and develop the skills to ensure their efforts make an impact.